This quick and easy pork recipe can be on the table and ready to eat in less than 20 minutes. Heat the oil in a frying pan over a medium heat, then add the pork and cook for about 15 minutes, turning halfway through, until the meat is cooked and there is no more pink meat. Meanwhile, in a small bowl, mix the honey and mustard together. When the pork is cooked, reduce the heat, pour over the mustard and honey mixture, and bubble for 1-2 minutes. 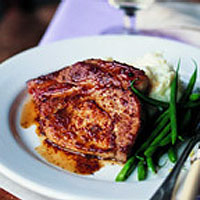 Serve with mashed potato and green beans.